The Chartered Institute of Payroll Professionals (CIPP) has been named 52nd in The Sunday Times top 100 Best Not-For-Profit Organisations to work for list. 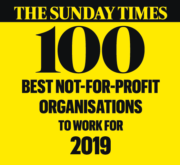 The CIPP has been named in The Sunday Times top 100 Best Not-For-Profit Organisations to work after demonstrating its commitment towards staff development. The award acknowledges excellence in workplace engagement and is judged purely on a staff survey – with only the highest level of overall employee engagement qualifying for the top 100.